Black 2 and White 2 Other Pages: Medals | Gotta polish 'em all!! New to Pokémon Black 2 and White 2, Medals are commemorations given to you throughout your journey in Unova as you undertake and complete your Pokédex. 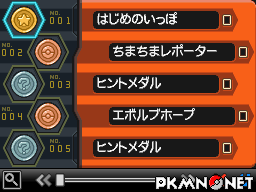 These Medals are given to you once you have cleared certain requirements, such as beating certain trainers with only certain Pokémon, or doing specific and somewhat random tasks. Given out by a Medal Master, which can be found in every Pokémon Centre across Unova, the Medals are stored away in your Key Items in the form of a Medal Box. Should you have cleared more than one goal between visits to the Medal Master, he will simply supply you with all of the Medals earnt in one go, so you don't have to keep asking. The little things, right..? Furthermore, you will be given the option of pinning one of your Medals onto your trainer card, allowing any trainers who interact with you to see the Medal on your trainer card, along with how and when you achieved it. This also shows up on your Global Link profile too. Dazzling! Guest on Wed 10 Dec 2014 21:12:12 UTC. I hate medals. I thought the guy was stalking me at first, since I always saw him in the pokemon centers . . . Page generated with 19 queries, excitingly.